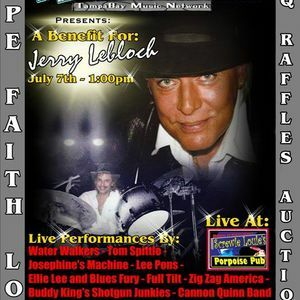 The Jerry Lebloch Benefit from Screwie Louie&apos;s Porpoise Pub - 7/7/2013. The Jerry Lebloch Benefit from Screwie Louie&apos;s Porpoise Pub - 7/7/2013 - This was a benefit for the former drummer of Rare Earth, Jerry Lebloch, who is suffering from stage 4 colon cancer and needed a helping hand to offset medical costs. We had 9 bands playing trying to raise money for Jerry. They were Full Tilt, Water Walkers, Shotgun Junkies, ZigZag America, Josephine&apos;s Machine, Mad Beach Mafia (featuring Johnny Lee Middleton of Savatage & Trans-Siberian Orchestra & Jimmy Delisi of Juliet), Ellie Lee and Blues Fury, Cannon Quinn Band, Single Malt Brothers. Jerry Lebloch got up and jammed with Josephine&apos;s Machine and showed us all he still got it with a major drum solo not to be missed. We would Like to Thank Everyone who came out and supported Jerry in his time of need and all the sponsors like WSNR Social Network Radio, KAM- BABS Promotions, Seminole Music & Sound and so many others. Thanks John from the Shotgun Junkies. Hope it helped out.